1. Focus only on the issues that make or break Christianity. Realize this: People can and do easily get off course, discussing, debating, and getting depressed over issues that are not linchpin issues to Christianity. From the details of creation/evolution to the inerrancy of Scripture, some people’s faith can be quite disturbed—quite unnecessarily disturbed. For example, while I believe in the inerrancy of Scripture, if one of the authors happened to get a detail wrong, this does not mean that the entire Christ story is false. In what area of life do we find the same standards? This can be called a “house of cards” theology. In other words, if one card falls, they all fall. Our faith should never be a house of cards. There are so many things that we are all going to be wrong about when we get to heaven. I have often said that theologians need to be well rehearsed in recantations in order to get prepared for heaven! However, while the Christian faith is not a “house of cards”, there is a definite foundation. 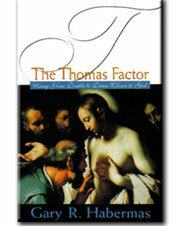 This foundation, first and foremost, is the resurrection of Christ. If Christ rose from the grave, Christianity is true. If he did not, it is false (1 Cor. 15:3-4; 1 Cor 15:17). Since this is an historic event that took place in a public arena, with dates and people involved described, from a historians standpoint, it longs to be examined. As Daniel Wallace has put it, “The fact of the incarnation demands an incarnational method of inquiry and examination” (i.e. not a merely a “spiritual” examination). Therefore, from a purely intellectual standpoint, I would set down all other studies, including conversations with those who are representing another religion, books about atheism, or the destiny of the unevangelized. Just to focus on this central issue of Christianity. There is so much good stuff out there on this subject, but I would start here and graduate to here and here. Listen or watch to the debates with William Lane Craig about the historicity of the resurrection. Again, if Christ rose from the grave, Christianity is true, God does love you, and we just have to work out the details. If he did not raise, the journey goes on and we look elsewhere. Rarely have I found someone who is in the crucible of intellectual doubt, yet has a strong conviction about Christ’s resurrection. A conviction about the resurrection goes a long way to stabilize your faith. There are many doubts going through your mind. However, don’t mistake a doubt with a belief. Do not give to your doubts the credence that Christianity no longer holds in your life as if they have greater right to your beliefs than what you were formerly assured of. Remember, as unassured as you may be that Christianity is true right now, give equal unassurance to its alternatives, including agnosticism. 3. Make sure that you don’t lose fellowship with other believers. Often Christians feel as if they need to validate their faith by only hanging around those who are not of the faith. I often see this with young men who are enthusiastically engaged in apologetics (defending the faith). The idea is that if the faith is true, it can withstand any onslaught. While this is true in theory, it is not very pragmatic in any area. One normally becomes emotionally predisposed to those of their immediate fellowship. “Following the crowed” is a very effective means of being persuaded of the most unlikely beliefs. In fact, I have often said that if I hung around the flat-earth society members too long (and there is a flat earth society! ), I may begin to doubt that the world is round. This is not because the arguments or evidence is persuasive, but simply because of implicit emotional control of belief that such constant fellowship affords. Give equal (if not more) time to fellowship with those who are strong in the Christian faith. Our faith must be allowed access to the strength that common fellowship provides. 4. Realize that the presence of other possibilities does necessarily not equate to the presence of other probabilities. Every decision we make in life is based not on infallible certainty, but degrees of probability. Many people get their faith disturbed when they encounter other theories or explanations. No matter how unlikely these other theories are, their faith is disrupted simply because other theories exist. But the fact that there are many alternative possible options out there does not mean that these options are probable or worth your time. In other words, the possibility of an alternative should never equate to the probability of the alternative. When it comes to the resurrection of Christ, the possibilities are endless: group hallucinations, stolen body, Christ did not really die (swoon theory), an unexplained anomaly, body eaten by dogs, mistaken identity, and a thousand others. However, when all the evidence is considered, we find that these possibilities, while possible, may not explain the evidence as well as a simple belief that Christ rose from the grave. In other words, to suspend faith due to the presence of other possibilities is actually putting unwarranted faith (i.e. blind faith) in a less likely option. 5. Don’t think you can ever be an expert in everything. You will never be an expert on everything (and probably not even one thing). No one is. Humanity has quite a bit of self-delusion concerning how much we know. We may know a bit more than the next person, but to call anyone an “expert” in any one area is quite silly and self-inflated. Even the greatest minds that have ever lived are quit small when compared to all of reality. If your aspiration is to come to know everything before you make a solid decision, then you will be an eternal tire-kicker with regard to your faith. You will always be one step, one bit of evidence, one unexamined option away from faith. The other day I was boarding an airplane. I began to think of all the wrong things that could go wrong. My anxiety rose as I thought about the innumerable possibilities of something bad happening. They are never-ending. I would have to become an expert in so many things in order to examine what needs to be examined to make a decision that chocked out all uncertainty. I will never be an expert in all these areas. However, this does not mean that I am making a morally responsible decision to stay off the plane. I have to confer trust in the expertise of others—even trust of my very life. But this trust is well-placed as the probability that they know what they are doing is strong. At some point there is not only a sufficiency in probability, but a moral obligation to the probability that makes indecision the greatest example of blind faith there is. 6. Be careful not to make individual emotional preference a decisive benchmark of truth. I see so many people who set their own emotional or moral preference as the ultimate and decisive standard for truth. For example, some people say things like “I could not every believe in the God of the Old Testament. He is mean and cruel.” Fine as that may be, our personal opinions about God’s meanness or niceness do not have a vote in truth. If God is mean, so be it. That is an internal debate. Our attitude or emotional disposition has no bearing on God’s existence or authority. I recently saw a respected Christian scholar say that if God were such and such way, I would not serve or worship him. In essence he was saying “If God does not satisfy my emotional disposition, possessing characteristics that I think he should have, he will not be my God.” As understanding as I am of this in one sense, in another sense I have to express complete bewilderment and sadness. We worship and serve God because he is God not because he is God and we like him. If God is God, he is Lord and King. We don’t petition how we think he should be. Alternatives are not suddenly valid when we don’t like him. Truths about God are not a democracy. The first question is not whether God is mean or a “moral monster”, but whether he is God. Then we can discuss the problems with God in the Old Testament or God’s decree of election. I certainly don’t believe that God is cruel in the OT or NT. I do believe that God loves mankind because he says he does (John 3:16). He is a better authority on himself than I am. My point is that this is not an issue that should occupy your focus and it certainly should not cause you to have doubts about God’s existence. If Christ rose from the grave, whatever conclusion one comes to about any number of peripheral issues does not have the poison of death either way. 7. Don’t stop living out your devotion to Christ. You are merely doubting your faith. You are not a unbeliever. Therefore, don’t live according to your doubts, but live according to the faith that you still have left. Sometimes doubt is brought about by the mere fact that we are no longer devoted to Christ as much as you once were. Sin and disobedience can produce an unhealthy doubt. Further doubt can often be an excuse for our lack of devotion. Therefore, commit yourself once again to the belief that you do have, not the one that you don’t have. If you live according to your doubt, then all you can expect is further doubt (Luke 8:18). 8. Realize that doubt is not a bad thing. Often, doubt is the first sign of true or deep faith. It is only through doubt and an acknowledgement that we could be wrong that we come to true convictions about what we believe. God is not scared or angry about people’s doubts when they are truly searching for the truth. He challenges us over and over again in the Scriptures to be wise and stop being naive. 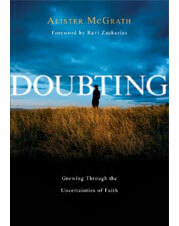 If our faith is true, it can handle doubts and skepticism. I have been through many periods of doubt and every time my belief came out stronger. I believe that yours can to. I pray that this is helpful for you. This entry was posted on Wednesday, November 16th, 2011 at 6:44 pm	and posted in Uncategorized. You can follow any responses to this entry through the RSS 2.0 feed.